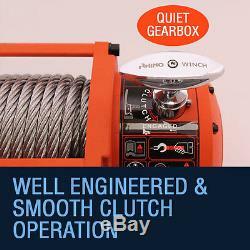 We at rhino winch pride ourselves on having the smoothest, most reliable and quietest winch on the market. This is due to high tensile, precision engineered planetary gears and the seamless clutch action of our gearboxes. Our breaking system is second to none as are our powerful copper wound motors with their revolutionary heat diffuser. 20000lb RHINO WINCH STEEL Popular. 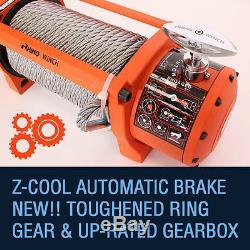 17500lb RHINO WINCH STEEL Popular. 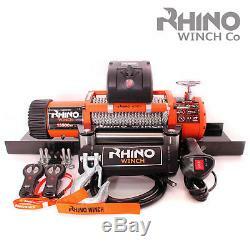 13500lb RHINO WINCH STEEL Popular. 13500lb RHINO WINCH SYNTHETIC Popular. 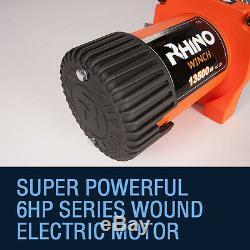 4500lb RHINO WINCH STEEL Popular. 3000lb RHINO WINCH STEEL Popular. 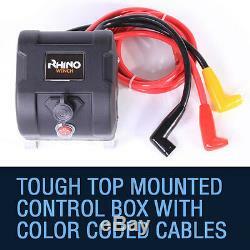 12v 13500lb steel cable RHINO WINCH. "All terrain" winch sealing ensures superior water resistance, longer life and better performance. Fast, powerful and reliable in extreme conditions, this winch is designed for the serious off-roader who demands a winch that will perform under the most extreme conditions time after time after time. Quality without the price tag and with a no fuss guarantee. This product is Guaranteed for 24 months against defective materials and workmanship. Auto Brake Roll Back Protection. Using high tensile, precision engineered planetary gears and a seamless clutch action, this winch is easy to use and highly reliable. Rhino winches also feature highly advanced systems that will automatically apply the brake to protect your load from roll back. This winch comes with a wired remote control for those tricky situations such as loading a quad bike whilst remaining on the vehicle. It also comes with two wireless controllers so you will be able to use your winch from up to 100 meters away. Quality Motor with Heat Diffuser. No expense is spared when it comes to the design and build of this winch. Featuring the very best 6.8hp Series copper wound (not cheap aluminium like most other brands) motor and revolutionary heat diffuser technology. 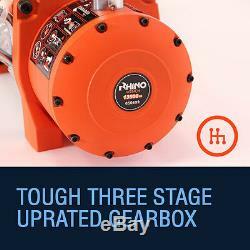 Tough three stage up-rated gearbox with toughened ring gear. Well engineered & smooth clutch operation. Revolutionary new motor air cooler. 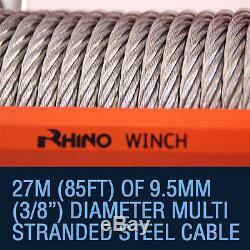 27m (86ft) of 9.5mm (3/8) Diameter Multi Stranded steel cable. 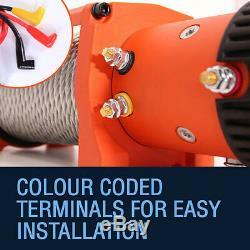 Color coded terminals for easy installation. Reinforced CHASSIS to cope with the additional power. Clevis hook with marker tab & bolts. Tough top mounted control box with colour coded cables. 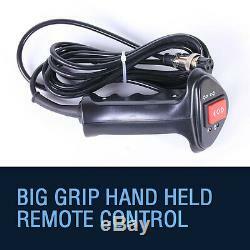 Big grip hand help remote control. Heavy duty earth cable with terminals. 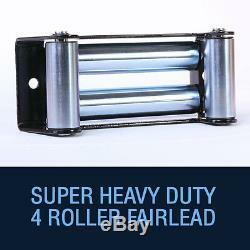 Super heavy duty 4 roller FAIR LEAD. Winch cover with every order. This product is guaranteed for 24 months against defective materials and workmanship. The guarantee excludes the wire rope, damage caused by misuse, failure to follow the instructions, or submersion. It is recommended that an isolator switch is installed on all electric winches by a qualified auto electrician and inspected every six months. For all manuals and additional service advise, please visit the Union Mart Website. Cosmetic Changes and improvements may be implemented without prior Notice. Rated Single Line Pull: 13,500lb (6123kg). Motor: 6.8hp/5.0kw, Series Wound "Maxi Cool Series" Reduces Heating. Control: Remote Switch, Big Grip, Extra long 3.7m lead, 2 x Wireless Remotes. Gear reduction ratio: 265 to 1. Braking Action: Automatic load holding brake in the Drum provides superior operator control. Drum size: Diameter 64mm (2.52") Length 224mm (8.82"). Cable: 27m (85ft) of 9.5mm (3/8) Diameter. Fair lead: 4-Way Roller Fair lead. Battery Leads: 2 Gauge, 1.83m (72) 35mmsq - 6.5mm Diameter. Mounting Bolt Pattern: 10.00" x 4.50" Universal Standard. No Load Line Speed: 7.2m/min (23.75 ft/min). 1 x 500A "Warn Type" Solenoid. 1 x Heavy Duty Fair lead Roller. 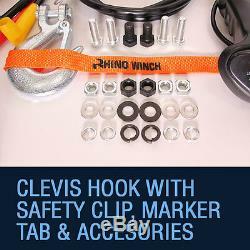 1 x Clevis Hook with safety clip and marker tab. 1 x Big Grip Hand Held Remote Control. 2 x New Style Wireless Remote Control. 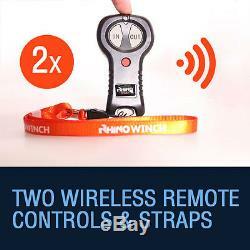 2 x Rhino Winch Lanyards. 1 x Next Generation Control Box. 1 x 27mtr multi stranded steel cable fitted to drum. 1 x Set of Stainless Steel Fitting Bolts. Dimensions (Boxed): 579mm x 199mm x 230mm. Gross Weight (Boxed): 45KG (99lb). Our Comprehensive Range of Official Spares and Accessories. The guarantee excludes the rope, damage caused by misuse, failure to follow the instructions, or submersion. Photos and/or videos of the item may also be requested to assist in the return process. The item "12v Electric Winch 13500lb RHINO, Heavy Duty, 4x4 Recovery + Mounting Plate" is in sale since Tuesday, September 23, 2014. This item is in the category "Vehicle Parts & Accessories\Other Vehicle Parts & Accs". The seller is "union-mart-uk" and is located in Southampton. This item can be shipped worldwide. Motor: 6.8hp / 5.0kw, Series Wound "Maxi Cool Series"